Buy 10 yoga passes for only $9 each. A perfect present for the one you love (even if that's yourself). Buy 20 yoga passes for only $8 each. A perfect present for the one you love (even if that's yourself). Simply Yoga's Beach classes began in 2009 on the beautiful Suttons beach in Margate, Redcliffe. Your teacher is Monica Batiste who has been teaching yoga since 2004 and has been working in the fitness industry since 1986. Her fitness background is in yoga, personal training, aerobics, massage therapy, nutrition and weight loss counselling. Yoga is recognised as an ancient system of philosophies, principles and practices derived from the Vedic tradition of India and the Himalayas more than 2500 years ago. It is a system that recognises the multi-dimensional nature of the human person, and primarily relates to the nature and workings of the mind, based on experiential practice and self-enquiry. Yoga is a wonderful way to stretch and tone your whole body, it is a powerful personal transformational tool that will change your life in a positive way. Yoga for Little Bears includes yoga poses, a poem with each bear, and instructions on how to do each pose. It includes chapters on emotional intelligence, the empowering language of the virtues, and innovative yoga poses that reflect the Australian climate. 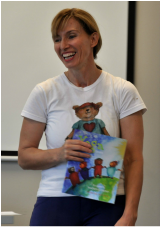 The emotional intelligence incorporated in this book help children protect themselves from bullys, soften their approach if they are a bully, and develop strong self-esteem to grow to their highest potential. Wear comfortable clothing, no shoes required. Phone Monica on 0409 052 768 if you are not sure where we are. By accepting your self in every posture, you learn to accept yourself in life. By opening your heart in 'heart opening' postures, you learn to let go of the resistance in your heart and let love in. The deep breathing in yoga lowers stress hormones and increases happy hormones, so you will increase happiness and attract more positive experiences. Yoga is the microcosm of your life. The more you love yourself in yoga, the more you love yourself in life. Yoga can be practiced at home or in a group. However you practice yoga, you will learn more about yourself and bring joy and harmony to your life. There are easy postures for beginners, and more advanced postures for when your body has improved in strength and flexibility. The added bonus to yoga is it doesn't matter if your young, old, sick or well, you will be able to practice yoga and improve the quality of your life. Here at Beach Yoga, we intend to love and accept each other just as we are.